Business at the speed of now. speeds at a price that works for today. The wait for affordable, fiber-based Internet is over. In fact, at these speeds, the wait for pretty much anything is over. How Fast is Fast? How Fast is Fast? With symmetric speeds, your team can be producing, sharing, posting, publishing and uploading just as much as they’re downloading. No overage charges, and no usage caps. That sounds productive. The consistency and dependability of a fiber-based network with symmetric bandwidth backed by business-grade customer support. You don’t have to worry about keeping your computers, servers and data protected. We can do it for you with our comprehensive Security Suite, powered by McAfee. 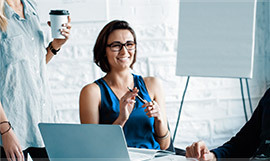 COX Fiber Internet gives your business speed, and choices. With multiple options and customization opportunities, you can find the fiber that works for you. No matter what business you're in, you're in the business of right now. Real-time. Can I get that yesterday? Business is moving at light speed and with Cox Fiber Internet, your business can move at speeds up to 1 Gbps. That's anywhere from 3X to 100X faster than the standard business Internet connection. No more worrying over buffering or progress bars. With 1 Gbps speed, your business can move as fast as you can. Want to go even faster? If your business needs more bandwidth, then you're ready for Cox Optical Internet, a dedicated, enterprise-grade, fiber service with symmetrical speeds up to 10 Gbps. Businesses today are more productive than ever. You're using more data, but you're also creating more, sharing more, collaborating more, and making more. File uploads are just as critical—if not more so—than downloads. That's why Cox Fiber Internet offers symmetric speeds up to 1 Gbps. Unlike asymmetric lines, heavy traffic in one direction won't affect network speed or performance in the other. So when critical data needs to be delivered—or received—you have the reliability of knowing it will be. 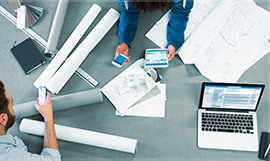 Your employees aren't just using a single device anymore. They're sending emails from their phone, reviewing files on their laptop and checking business apps on their tablet. Screen sizes are getting larger, resolution is getting better, content is getting richer and the data capacity your business needs is exploding. Work doesn't just happen in the office anymore. Shared drives and cloud-based applications help facilitate an "anywhere office," but there's something else they add. Data. Constant streams of information to the cloud and back again are demanding faster and faster speeds to keep up with the heavy workload. From web-based presentations to video conferences to streaming training videos or even a playlist for the office, you have more opportunities now than ever before to receive and/or publish rich, high-definition, real-time content. When you're running a business, you've already got a lot to think about. Network reliability shouldn't constantly be in the back of your mind. Instead, know it's always at the top of ours. Cox Fiber Internet includes secure, remote, automatic file backup at no additional cost. 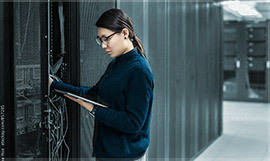 Powered by Mozy™ by EMC, Cox Business Online Backup (CBOB) keeps your critical server files safe and accessible from any location with an Internet connection. You put out plenty of fires on a day-to-day basis. Making sure your data is safe should be fireproof — and foolproof. 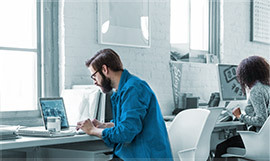 Cox Business Security Suite powered by McAfee helps protect your business from viruses, spyware, hackers and more with an all-in-one solution that makes safeguarding your data one less thing to worry about. want protected, and your computers/file servers are safe and secure. You can personalize Security Suite to fit your needs using the SecurityCenter online management tool. can run on-demand virus scans any time you want. Suite and your Cox Business Internet or other data service account is in good standing. Macintosh support is being considered for future enhancements to Security Suite. 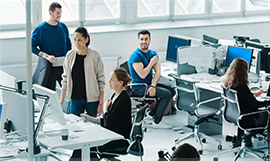 Our customer-focused Cox Business Account Executives can help you find the fiber solution that works best for your business now, and in the future. Asymmetric or symmetric speed tiers available up to 1 Gbps. Available in serviceable Multi-Tenant Units (MTBU) or Single-Tenant Units (STU/STBU) with fiber access. Even the fastest connection can bottleneck if your WiFi router is out-of-date. That's why we offer only the latest 802.11ac routers. Choose between a dynamic or static IP address, with the option of adding additional IP addresses and CIDR blocks as needed. Access to the Cox Business MyAccount web portal where you can manage your services, pay your bill or chat directly with customer support. *Integrated Online Backup and Security Suite licenses could be as much as a $100/month value if purchased from third party vendors separately.